Well, my friends! It's the end of January and therefore time to wrap up the Lucy Maud Montgomery Reading Challenge (yet again!). I'm always so excited to kick this thing off and so surprised when the month is over. So here we are. I have a few more posts coming up next week related to this challenge because there's a little matter of an Anne of Green Gables tea party which I haven't quite wrapped up. I'll be posting some details about that and then I also managed to squeeze in another reading of Anne of Green Gables which is proving quite delightful. I'll post my thoughts about spending more time with Anne as well. This is my first year to involve my children in this challenge (in terms of books read). A year or so ago I introduced them to the Road to Avonlea television series so they are familiar with something of Montgomery's, whether or not they could identify it as such. Because Montgomery tends to be a little flowery in her wording, I wasn't sure that they'd be able to track with one of her stories just yet and have wanted to hold off until I thought they could truly appreciate and enjoy it. Then came Amy who mentioned she would be reading The Story Girl to her kids (who are roughly the same ages as my kids). Well (! ), if she could do it, I probably could too! Thanks, Amy, for the nudge/peer pressure shove. (wink) It is much appreciated. This was a good reminder to me that my kids can likely handle a lot more classical literature than I typically give them credit for. I'm very much looking forward to hearing what each of you read this past month. If you wrote up a post sharing your thoughts, this is the time to link up and share. Leave a note in the comment section below if you would. If you do not have a blog but feel like talking about Montgomery, please still do leave a comment. I'd love it if you did! Make sure you visit 'round and see what other people managed to squeeze in. Then, of course, mark your calendars for next January for the 7th annual LMM Reading Challenge! I regret to report that no tea party happened here this year. One year I'm not going to be so committed elsewhere (co-op, Bible study, basketball) and will be able to pull one off. I'm about 3/4 of the way through Emily Climbs - hope to have a review up next week. I read, L.M. 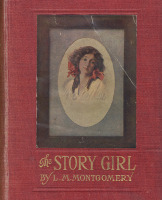 Montgomery Short Stories 1905-1906. I'll probably be reading the Further Chronicles next year for the challenge! I reread Anne of the Island and introduced myself to the Pat novels. Here are my thoughts! I'm concluding a little late, but I read Anne of Green Gables and a literary criticism Looking for Anne of Green Gables by Irene Gammel. My own wrap up is here. I am sorry to say I did not like it very much. But I am off to see if you reviewed it somewhere and what you thought about it - I'm sure you probably saw something in it I missed. I searched your site but didn't find that you reviewed Emily Climbs - let me know if you did and I missed it. I would love to read your thoughts.